Optimized for Internet Explorer 3.0 or above and Netscape Navigator 3.0 or above. If you have an earlier version, or another browser, all pages may not be presented exactly as designed. 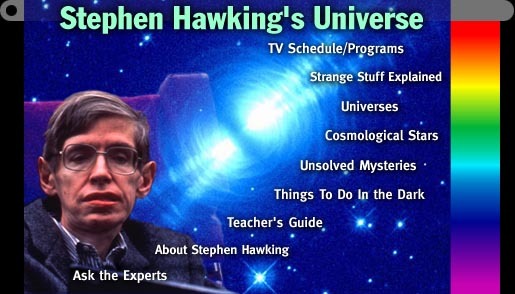 Note to New York-area Viewers: Thirteen/WNET will locally broadcast all six episodes of STEPHEN HAWKING'S UNIVERSE Saturday, January 17, 1998, from 3:00 pm until 10:00 pm. Where do we come from? How did the universe begin? Why is the universe the way it is? How will it end? All my life, I have been fascinated by the big questions that face us, and have tried to find scientific answers to them. If, like me, you have looked at the stars, and tried to make sense of what you see, you too have started to wonder what makes the universe exist. The questions are clear, and deceptively simple. But the answers have always seemed well beyond our reach. Until now. The ideas which had grown over two thousand years of observation have had to be radically revised. In less than a hundred years, we have found a new way to think of ourselves. From sitting at the center of the universe, we now find ourselves orbiting an average-sized sun, which is just one of millions of stars in our own Milky Way galaxy. And our galaxy itself is just one of billions of galaxies, in a universe that is infinite and expanding. But this is far from the end of a long history of inquiry. Huge questions remain to be answered, before we can hope to have a complete picture of the universe we live in. Six essays by ASTRONOMY magazine Associate Editor Richard Talcottone for each program of the STEPHEN HAWKINGS UNIVERSE seriesexplain the ideas, discoveries, answers, and questions of the universe and beyond. These original essays draw from the programs and analyze the key issues, whether simple or complex. Also included: national and local TV schedule information. What in the world (or in the universe) are quarks and quasars, nebulae and neutrinos? How can time be imaginary? Is a wormhole anything like an anthill? For definitions and descriptions of the tricky terminology of the universe, this is where the strange stuff becomes a little less so. History will, no doubt, recognize many of todays theorists and scientists for their astonishing collective and personal contributions to our future understanding of the universe. Here we recognize somethough certainly not allof those whose ideas or discoveries have, over time, shaped human understanding of the stars and beyond. Hundreds of years ago, everyone believed that the Earth was at the center of the universe. Today we know better, but a complete picture of the universe remains elusive. From the ancient notion of a flat Earth to todays theories on the very shape of past and future history, ideals of the universe have evolved with the help of scientific discovery and the eternal human imagination. Leading cosmologists address the questions even they have yet to answer. MARCELO GLEISER: Where Does Matter Come From? CARLOS FRENK: Where Is the Missing Matter? ALAN GUTH: An Eternity of Bubbles? SETH SHOSTAK: An Inhabited Universe? MICHIO KAKU: Is There a Theory of Everything? LEE SMOLIN: What Is the Future of Cosmology? Some Web sites present fascinating photographs from galaxies millions of light-years away, while others feature online discussions among todays leading cosmologists. But where to look first? Our resources list describes and links to great spots on the Web, as well as books and magazines, for the cosmology enthusiast. Our free downloadable Teachers Guide, in PDF format, is also available here. Submit your own questions about the universe to prominent cosmologists.